Anton F. Post, senior scientist at the Marine Biological Laboratory in Woods Hole, Mass., has been appointed director of CRC. He succeeds Stephen Olsen, the founding director who led CRC for 40 years until his retirement in 2012. Post begins his new role in January. CRC’s International Programs Director Dr. Brian Crawford had been serving as the Center’s interim director since Olsen’s retirement. He will be responsible for providing overall leadership and directing all programs and operations at CRC, which develops policies and programs to help manage coastal zones in the U.S. and abroad. He will oversee an annual budget of $8 million and 22 employees in Rhode Island, as well as numerous contract employees overseas. Post holds academic and research appointments at several leading institutions. In addition to his role at the Marine Biological Laboratory, he is a professor in the Department of Ecology and Evolutionary Biology at Brown University and program director in the Division of Ocean Sciences at the National Science Foundation. He previously served as a professor at Hebrew University and a researcher and lecturer at the University of Amsterdam. “The Graduate School of Oceanography has a deeply rooted tradition in marine sciences and is ranked among the leading oceanography institutions in the U.S., both in terms of education and research. It is a privilege to become a member of this thriving community and bring my expertise in marine microbial ecology to complement the broad range of exciting research topics that are being entertained at GSO,” said Post, who will also hold an appointment as a URI professor of oceanography. 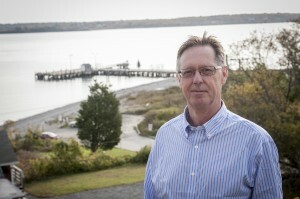 His research focuses on the biology of algae and its ecology, evolution and genomics. He has studied plankton on research expeditions in the Ross Sea off Antarctica, the Great Lakes, the Red Sea, the Pacific Ocean and elsewhere. Post received bachelor’s, master’s and doctoral degrees at the University of Amsterdam and served as a postdoctoral research fellow at Hebrew University.